I have to be honest, I intended to publish this review before Christmas (it would have made more sense), but better late than never... Right? 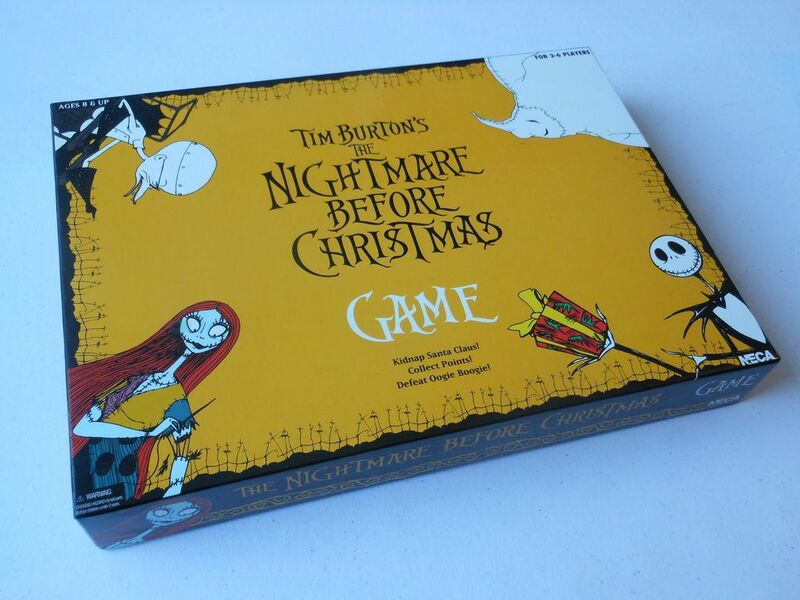 Tim Burton's The Nightmare Before Christmas is a typical NECA board game - rather beautiful, but not really much of a game. It's one of those games that is aimed squarely at the fans, who will buy a copy even if it's absolute crap. And yes, I am one of those fans. The board has an NBX label on the bottom, which is a nice touch. As already mentioned, NECA really went to town to make this game look nice so that it would appeal to fans who are not necessarily interested in board games, but who want this for their collection of movie merchandise. It ships in a sturdy box with a high gloss finish (hence the terrible photographs on this page with light glare all over the place), and plenty of great artwork to keep the fans happy. Inside the box is a thick board that features scenes from the movie, a spinner, two chunky dice, and six really nice pewter playing pieces. The board (I would have preferred illustrations to movie stills). Before I go on, I have to say, for a fan of NBX, these pewter pieces are going to be a big draw. 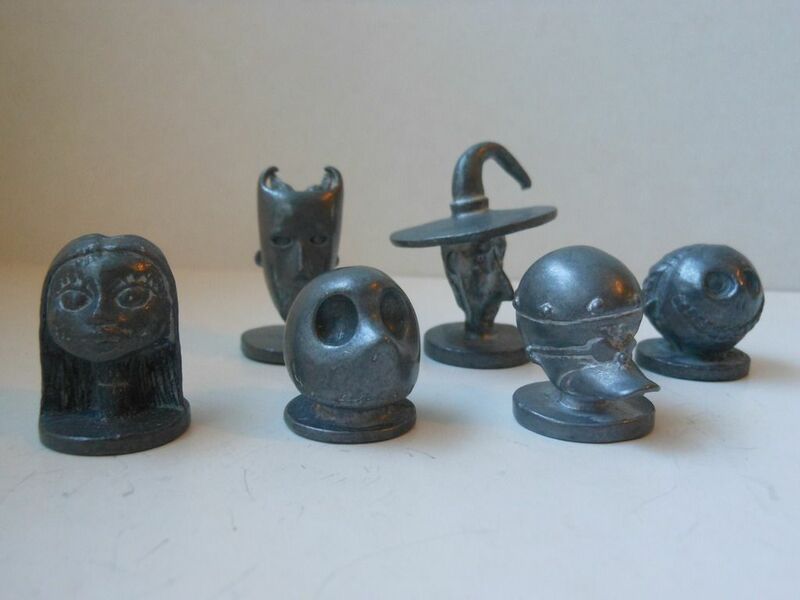 They are miniature busts of Jack, Sally, Dr Finklestein, Lock, Shock, and Barrel. Very heavy, very nicely sculpted, and worth the price of admission alone. Mine end up on the shelf at Christmas time as extra little decorations, I like them that much. In fact, everything in the box is of a very high standard except for the deck of playing cards, which are well-illustrated, but a little thin. However, while the components are excellent, the game is something of a disappointment. The aim of the game loosely follows the plot of the film. First you need to "kidnap" Santa Claus, then you need to collect 100 points (okay, that bit's not like the film), and then you need to "defeat" Oogie Boogie. Sounds great - but what does it mean? Instructions... A truly epic tome. Each player is initially dealt four cards. These cards will either show a red picture of Santa Claus, or a white picture of a character from the story along with a numerical value. The character pictures on these cards, match pictures on certain spaces on the board (well, sort of - some of the artwork doesn't match exactly, which is a bit confusing). Your cards are kept secret. The first player is the "biggest, scariest, most intimidating person" according to the rules, but as these things are not mutually inclusive, I just let the wife go first. On your turn, if you have a Santa Claus card in your hand, you just play it out in front of you for everyone to see. Once you have done this, you have "kidnapped" Santa and can begin accumulating points. It is not possible to accumulate points until you have played your Santa card. If you land on a blank space, your turn ends. If you land on a location space, you can draw one card (if available) from that location's draw pile. If you land on another player, you steal one card from that player and then send him or her to Oogie Boogie's lair. If you land on a space that shows a picture of a character, and you already have a Santa card in play, you can play one card from your hand that matches the character you landed on. You then score the points on that card. Once you get to 100 points, you can go for the end game. Spinner AND dice - you can never be too random, it seems. Once you have 100 points, you have to land on Lock, Shock, and Barrel's tree house location (by exact dice roll, of course, because that's always fun), which immediately teleports you to Oogie Boogie's lair for the final showdown in which you... spin the spinner. 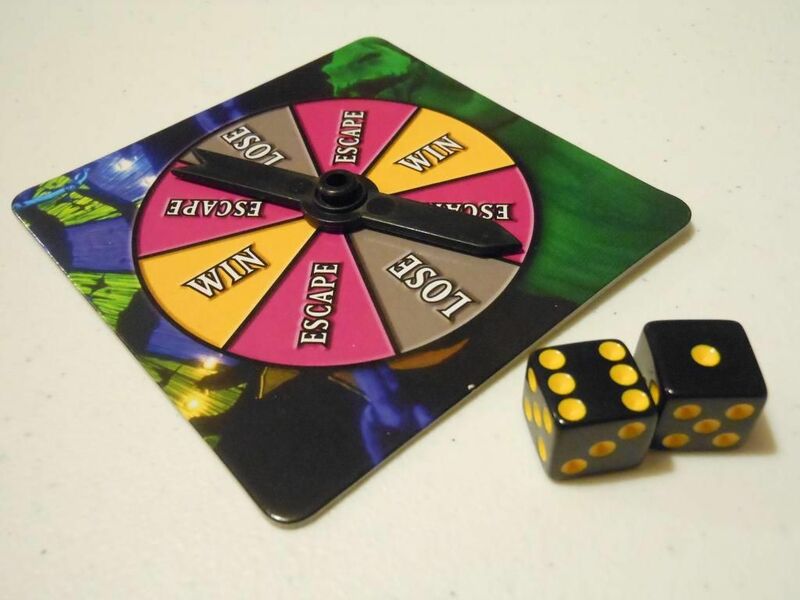 In the ultimate insult to gamers everywhere, when you spin the spinner, if you get a "win" result you have won the game, but if you get the EQUALLY LIKELY "lose" result, you are dead and out of the game. Yup, not even kidding. Dead. Gone. You kidnapped Santa, got 100 points, you were first to Oogie Boogie's lair, but you span the "lose" result and therefore lost completely. And yes, that does mean it is possible that at the end of the game, nobody has won. 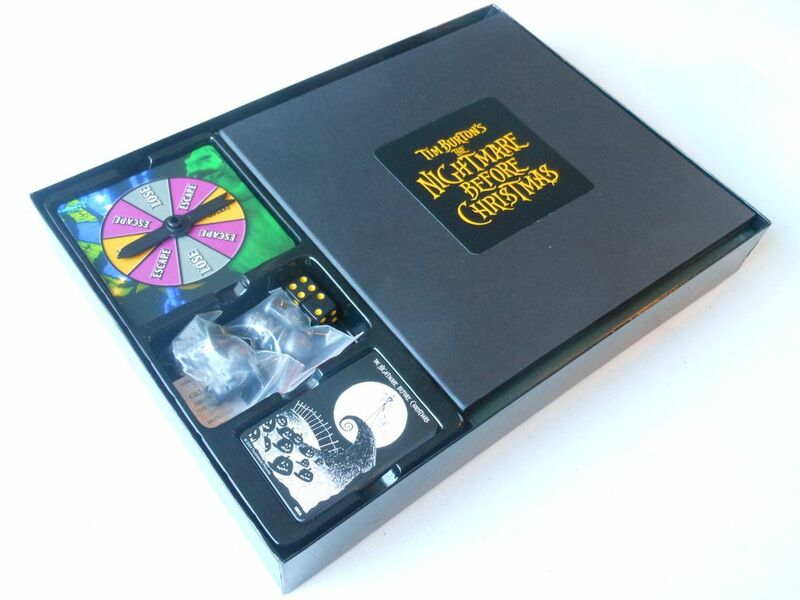 As you read this brief overview of the game (which isn't much shorter than the actual rules as printed inside the box), you will have noticed that there's quite a lot of randomness, and this randomness will entirely determine the winner of the game. It is possible to get lucky and to be dealt a Santa card as one of your four starting cards, giving you a massive head start on everyone else; but then again, you might not see Santa in the whole game and never even start to score points. Santa Claus was rubbish at blending into the crowd. Once you start trying to score points, you have to land on certain spaces, and you can only do that by exact dice roll, so you could spend the whole game trying to land on spaces that match cards you own, but constantly missing. 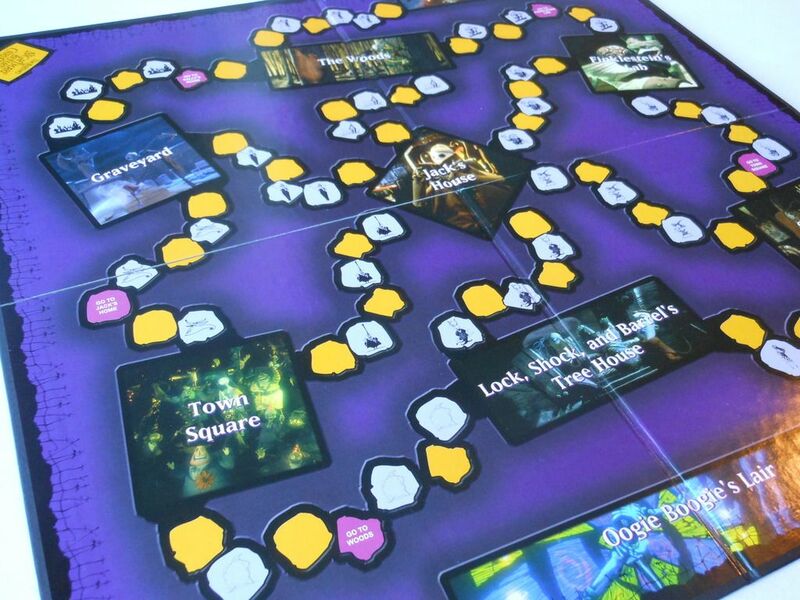 If you get sent to Oogie Boogie's lair, on each turn you have a 50% chance of escaping, so you could spend an age in there trying to get out and back into the game. And then if you do endure all that randomness and get 100 points, when you face Oogie Boogie in the showdown, you have a 25% chance of dying anyway and being eliminated from the game completely. What kind of reward structure is that? The game is infuriating, and just not that much fun. So that means I'm getting rid of it, right? After all, I have that rule where I only keep games I'm going to play... Well, here's the thing. I do play this game. Only at Christmas, and never more than once a year; but I do play it. It helps me get into the Christmas spirit, and isn't the worst way to spend half an hour with friends while having a few festive drinks. And beside, it's The Nightmare Before Christmas... Of course I'm not getting rid of it. I will keep mine then as I picked it up at a charity shop mint condition for the grand total of £2.50 ! Great find ! That is a real score. The game is poor, but anyone who loves NBX will want it for a collection; and there is more than enough going on to amuse young gamers. I got mine from Borders in the USA on clearance for $5 back in around 2005 and still have not played it at all. $5 is a great price, even if you just keep it as a collectible. The redesign is interesting; thanks for bringing it to my attention... 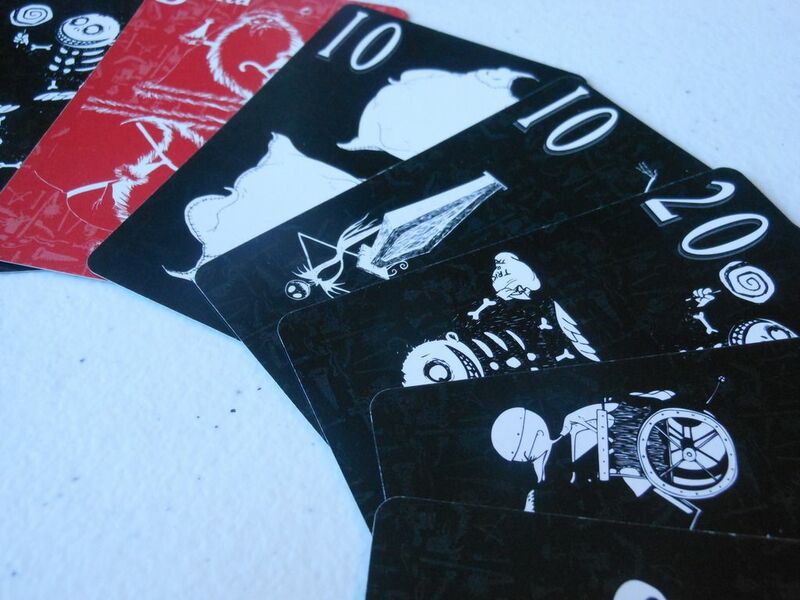 I think I prefer the board and box on the original version, but the cards are far nicer in the newer version. I would agree myself with the box the first revision in my opinion looks far nicer. Interestingly from your own image of the actual board itself I do not see any of the 'squares' with 'Go To Graveyard' or 'Go To The Woods', 'Go To Jack's House', 'Go To Sally's Room and 'Go To Finklestein;s Lab' If you take another look at the weblink I gave for the redesign, each of the skull and crossbone icon squares have one of these writings on them (four visible in the picture)...I wonder if the rules of game play have variance? Jack's pewter piece (unlike the others) is actually painted white..looks really nice. The dice dots are green and the spinning card is Win (Yellow), Escape (Green) and Lose (Orange) background art exactly the same. Also the spinning dial is Oogie Boogie's head. Regarding the "Go to..." spaces: I think the issue is more to do with my terrible photography. The original does indeed have "Go to..." spaces, and looking at the redesigned board, they are pretty much in the same spots. However, one or two of them are moved one space to the left or right, such as the one between the Graveyard and the Woods (if you enlarge my picture you should just be able to make out a pink space with white text on it). To be honest, my photography for this review is terrible. I think I might upload some new photographs. New photographs, including a photograph of the cards, which I somehow managed to omit the first time around. I actually prefer everything from the original. The Oogie Boogie spinner is an ergonomic nightmare. The art on the cards looks far more cartoon like on the 2nd edition. The spiderweb on the board adds a cluttered appearance. If I knew where to upload I would take pics of the 2nd edition so you can see. 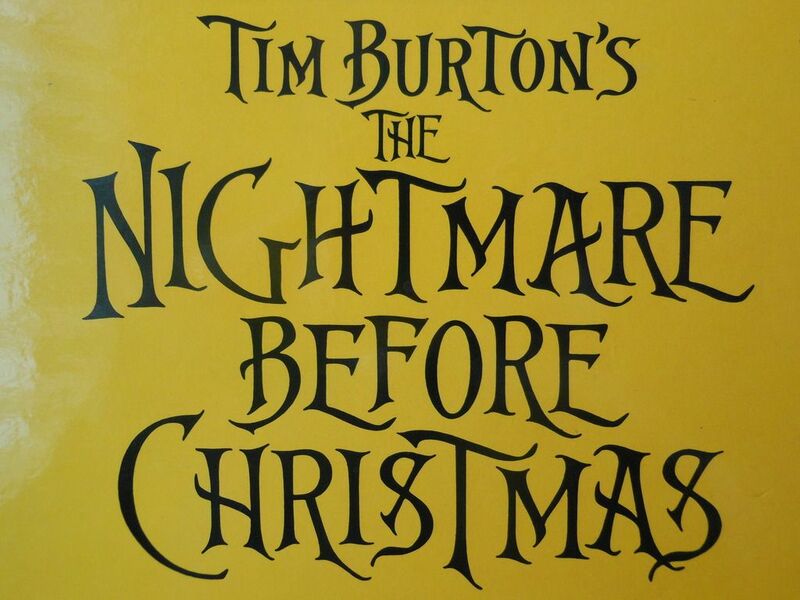 I was inspired to take a quick look around, and I found a lovely blog that had some pictures of the revised edition (http://mytimburtoncollection.blogspot.co.uk/ for anyone who is interested). I definitely prefer the overall style of the original. The box art really pops, and the board is a little easier on the eyes. It all feels a little bit closer to Tim Burton's original art for the story. 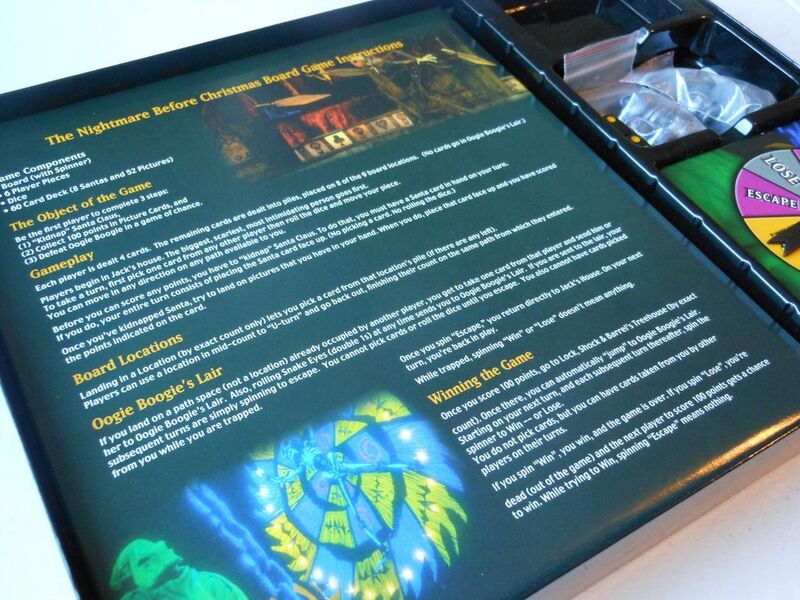 There's someone selling a set on eBay at the moment, but it would cost more than you paid for the game! There are also many eBay sellers offering inexpensive NBX figures that would work just as well. They usually come from China, in sets of six: Jack, Sally, Zero, and the trick-or-treaters. I'm not aware of NECA offering replacements directly though.